For some time now, I’ve been wondering where God is. Objectively speaking, I know, but like I said about prayer–I believe God is there, but it hasn’t really felt like he is. At Bible study recently, several women shared how God has been at work in their lives and in the lives of people around them. And I sat there thinking how glad I was. That God is at work in visible ways even if it’s not obvious in my own life right now, that these women are noticing where God is, and that they were willing to share their stories with us. And this is why we need people, why we need community, why we need Church–so that others can show us faith when we have misplaced our own. Of course, there are no guarantees that our own stories will get the same light that someone else’s did. But we may get glimmers, or light of a different kind entirely. Or maybe, for a very long time at all, no light at all. And that is when we so, so need people who will hold onto the hope when our hands cannot, and who will tell us their stories, with all of their wild goodness and pain and beauty. The world needs your story. I need your story. Stories are what carry us through and remind us of things beyond our own circumstances. They point us back to the God who is, the God who sees us even when we do not see him. Stories matter. Faith is hard. Anyone who dares tell you otherwise is, quite frankly, a liar. From feeling like God is being silent to having (mostly) stopped reading my Bible, I’ve been in one of the dry seasons. “Difficult” or “challenging” seems too extreme, as though there are certain obstacles I’ve been facing. Those would make it make more sense—if there was some sort of identifiable catalyst for this season—but I haven’t found it. This season just is. Admittedly, my response has not been what it’s “supposed” to be. Reading the Bible and praying are the steps most Christians would recommend for times of feeling like you’re in a spiritual desert, and those are the two things I have, to some extent or another, set aside for a time. I think my real problem with prayer is that I’ve stopped feeling like it works. Not that I’ve entirely stopped believing it works, but that I’ve stopped feeling like it works. For someone like me, who interprets life heavily based on feelings, this has left me looking at prayer a little side-eyed. Somewhat wary, unsure of it. In my head, I know this not what I’m supposed to base my prayer or any other part of my spiritual life on. 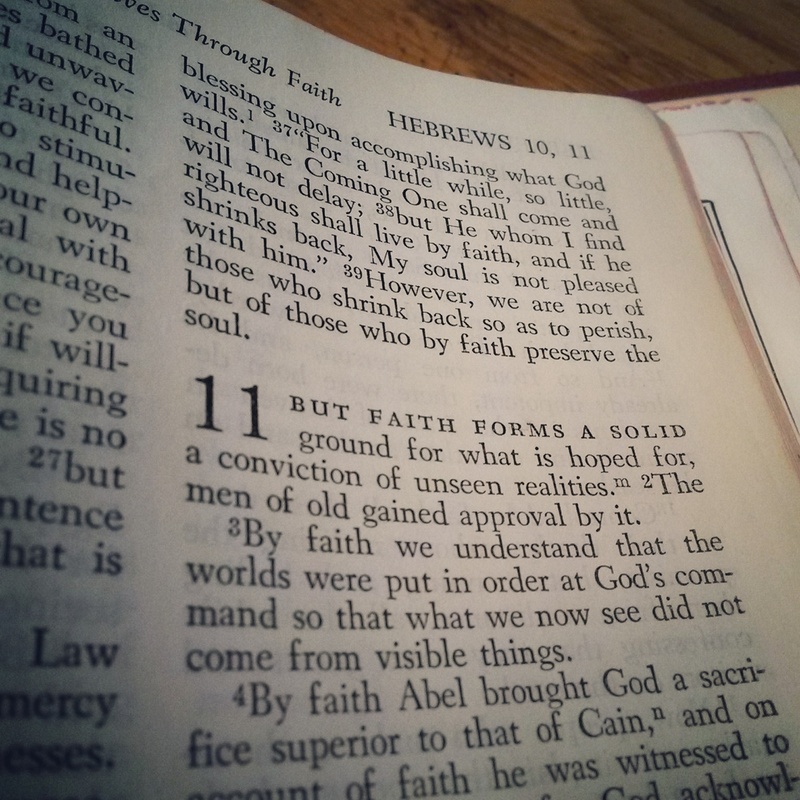 Somewhat inherent in the word “faith” is the idea of keeping after it, whether or not the feelings are there. This kind of faith is not one I have come to know well yet. I’d be willing to guess that prayer is one of the more difficult parts of Christianity for many people. If it doesn’t feel like it works, it gets hard to keep believing that it actually does work. And when the answer to “Please bring the right significant other into my life” or “Please heal them” or “Please fix this brokenness” keeps being no, the belief can start to flicker. Mine has. Right now, the belief in prayer is there, but dimmer than it has been at other points in my life. I don’t know what the path looks like to get back to the place of both believing and feeling like prayer works. Or perhaps, just belief will be the new normal. And maybe I’ll learn to be okay with that instead. p.s. How do you handle times when it feels like prayer doesn’t work? Today I went out to lunch with some coworkers. I was having a frustrating morning, so I ordered my feelings: a hamburger and waffle fries. And they were delicious. Exactly what I wanted, really. They didn’t totally fix my frustration, but it was something. And they sure tasted good. This is not an uncommon habit for me. When I’m frustrated or lonely or angry, my reaction is usually, “How can I eat this feeling away?” And a salad or piece of fruit is not my answer. The thought actually occurred to me today that, oh hey, I could pray about this. So I did—a quick prayer to God that I would have a better attitude. No sense of calm, no quiet reassurance that it would all be okay, no instantaneous better outlook on the day. My hamburger, however, was there for me. It had weight and substance, something tangible I could touch and smell and taste. Prayers are not food. They don’t take up space on my plate and in my stomach, like a hamburger. They don’t smell good and taste delicious as I chew them, like a brownie. They don’t tantalize my taste buds and fill my mug, like coffee. I can’t see, touch, or taste a prayer. But I can see, touch, and taste food. So I eat instead of pray, because I want an immediate fix for my frustration, loneliness, or anger, and food is there. Prayer is always there too, in that it’s always an option, but it doesn’t feel like an option I want to take when God seemingly ignores my little, easy prayers for “quick fixes” like a better attitude. In the grand scheme of things, couldn’t that only result in good? So why not answer it? There’s the possibility that I wasn’t really looking for the answer–I’ll fully admit that. Or, perhaps, it’s not so much a matter of a singular prayer that will fix my frustration, but a lifestyle of continual prayer. God is relational, and he wants a relationship with me–so if that’s really my aim, one-off prayers for attitude readjustments are not really the point. Hamburgers and chocolate and coffee are not all bad, but they are a bad substitute for God. p.s. Do you ever eat instead of pray?